Can tightly packed urban areas produce fresh produce? We’ve heard of the urban vegetable or flower garden that urban communities and city environmental groups have started, to bring the garden culture to the city. Here are two innovative companies that have taken it a huge step forward. Is it possible to expand beyond the individual tomato or lettuce plant that may feed one family for the summer? Yes. With the use of steel shipping containers and advanced climate technology to create optimal growing conditions, it can be done. Let’s take a look first at an interesting farming experiment using shipping containers to produce organic fish, fruit and vegetables right in the middle of city streets. 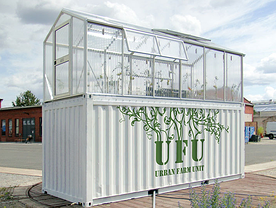 Urban Farm Units (UFU) are taking standard ISO shipping containers, adding a greenhouse structure on top, and creating an ideal growing environment inside. It’s an interesting way of rethinking cities, food production and consumption. This above ground urban garden uses standard components including hydroponics, industrial greenhouse scaffolding and an open top 20 foot steel shipping container to create the urban garden. The inherent design of a shipping container, including its standard dimensions, strength and stacking ability, creates the base for the ideal urban farm. This above ground solution brings the ability to have fresh produce close to the source of consumption. Whether it’s a local restaurant sourcing organic produce or the local consumer desiring a farm-to-table selection, these UFUs are the ideal urban solution. No greenhouse effect is used with Freight Farms’ solution as they use LED lights to grow plants year round in a completely enclosed 20 foot steel shipping container. A one acre farm in a 320 square foot box is possible with the right climate control, the uses of hydroponics and LED lighting to simulate night and day. This Boston-based company, barely three years old, introduced a scalable farming platform that can be operated anywhere. The ISO shipping container offers a water tight, weather proof structure that can withstand extreme weather conditions. The standard dimension construction of a steel shipping container allows for the stacking ability, creating a multi-level urban farm without using a larger piece of land. Both of these innovative farming solutions offer the ability for any community or business to begin its own sustainable farming effort regardless of the weather and space available. It is innovative efforts such as this in our industry that inspire us to help our clients ‘think inside the box’. Check out our case studies on custom solutions we've made for customers.